If you’re not visible for core keywords that describe your solar solutions in your service area, you’re letting competitors take your sales. Our core offering consists of holistic search engine strategy devised to lead generation services to make you the first company customers find when they’re in a buying mood. To outrank the competition, you need more than just keywords and links. You need a strategy – and a team – that works for your solar brand. 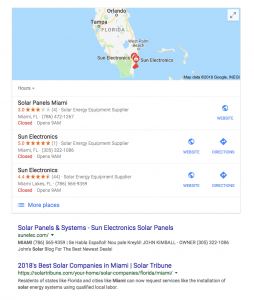 We are Google Maps SEO specialists for solar companies. Also known as “Google my Business”, there is no piece of real estate more valuable and cost effective in generating high quality leads over the years. Organic traffic from search engines is the best marketing investment you can make for your solar company. Rather than relying on paying for traffic, investing in high value keyword terms for brand visibility captures warm leads and demonstrates authority. With Simple Tree, you’re given a team of search-obsessed marketers who’ve ranked client’s in some of the most competitive solar spaces. Our clients expect leads – so we’ve built scalable, repeatable processes to handle every part of an SEO campaign that will get you on the first page and capture warm traffic, and massage entry level researchers into warm leads. It’s transparent, solar specific SEO, built to with last your competition. Understand your starting position, and the detailed set of strategies and tactics going forward back by research. We perform an in-depth technical website audit, evaluate your content, propose a new content strategy, analyze the backlinks against competitors, and comprise a blueprint to show you exactly what you need to do to improve your rankings, traffic, and leads. Never wonder how your investment is paying off. Our channel specific call and conversion tracking allows you to see exactly what keywords are converting traffic into leads. Your dedicated account manager is always available to answer questions, give updates and recommend the next steps to take to outperform the competition. Do You Need Cost Effective Leads via SEO? Request your custom SEO Blueprint to see what steps you can take immediately to improve organic rankings and traffic, while having a clear picture and strategy going forward . From B2B commercial solar firms, to local residential solar installers, SEO is an integral component no modern solar company can afford to ignore. Whether you’ve got a marketing manager, CMO or an entire in-house department, we play nicely with others and love serving as an extension of your internal team.